We webcast and film your events with best-in-class quality, service and price. Get your message out there. We’ll show you the difference between webcasting, webinars, podcasts and the like. With years of experience and hundreds of webcasts and webinars under our belt, we can help you. Relax, knowing your conference sessions will be recorded in high quality and made available online in lightning quick time. 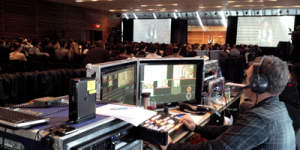 Live Media is adept at conference recording and film services. Break free from the ‘bored room’ and let the fun begin! Live stream your beauty pageant, sporting event, concert, while increasing revenues or charity fund-raising through a pay-per-view stream. For a high quality, personal, engaging experience between two or more locations consider video conferencing to bridge your communication gap with point-to-point or multi-point collaboration.